The Heavy Light collection by designer Benjamin Hubert for Decode, includes three sizes of pendants, a wall and a desk light and demonstrates an approach to design where an everyday material is used in an unconventional context. 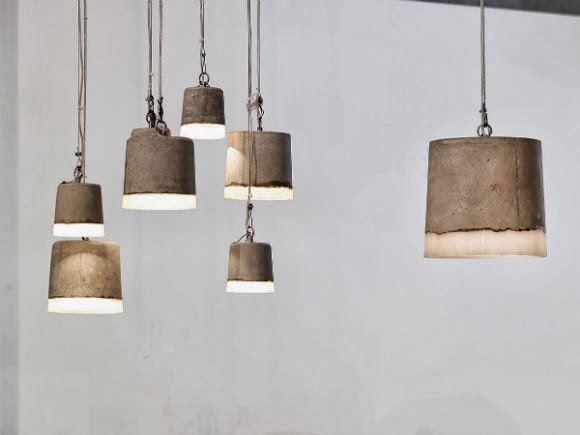 Heavy Lights offer a fresh perspective on concrete - usually considered an industrial material - and challenge perceptions of its use within domestic and commercial environments. 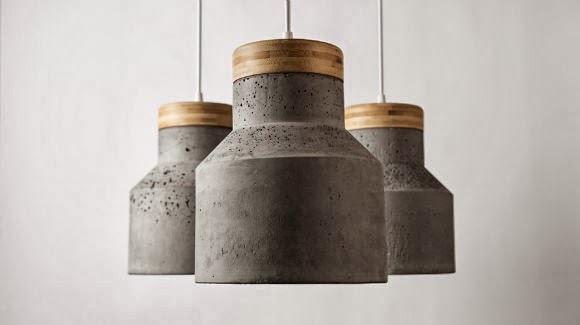 Manufactured in two different grey finishes as well as off-white and a terracotta finish, each concrete shade is individually slip-cast and left inverted in the mould to dry for a number of days. During this process, random air pockets and veining develop on the interior of the shade. These markings vary from one shade to the next and create unique and irregular marble-like patterns, which contrast with the shade’s smooth exterior. 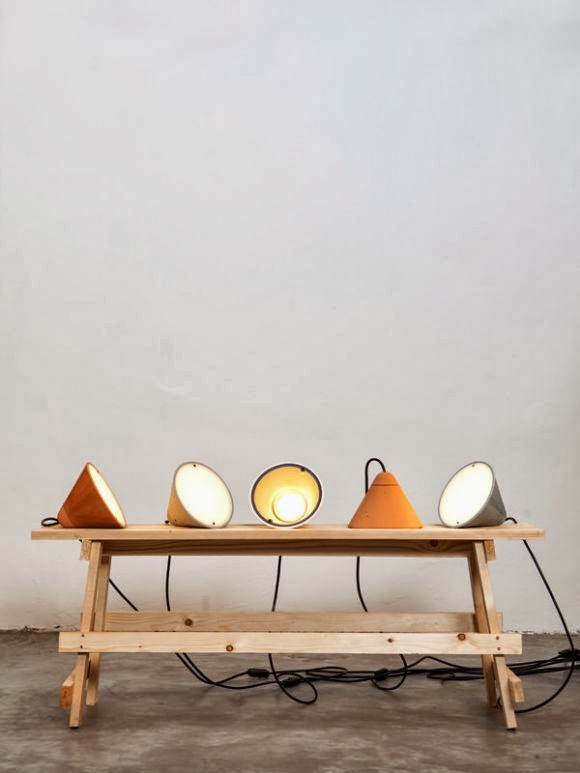 Orange glass shades sit on concrete bases to form these chalice-shaped lamps by London designer Magnus Pettersen. The Leimu lamps have tapered concrete bottoms that continue upward as glass. A bulb is placed at the top of this stem so light emanates thought the bowl above. Finnish glass company Iittala will release two sizes of Pettersen’s lights in September 2013. Contrast fascinates Pettersen, whose studio is based in London. His style is referred to as “industrial luxury” because opposites are a recurring feature in his work. He looks at how well different materials or colours merge in an interesting and functional way without prejudice. Mainly known about their “And” pendant light, Bentu Design,is a creative studio based in China. They use materials that are closer to the people as a way to promote handmade objects that have more significance than machine-produced ones. In the case of the And light, the materials used are bamboo and concrete. By adopting minimalist forms, it helps to center the mind rather than inundate it with too much theatrics. Not to mention that its aesthetic allows all of their lights to fit in just about anywhere, from homes to offices. 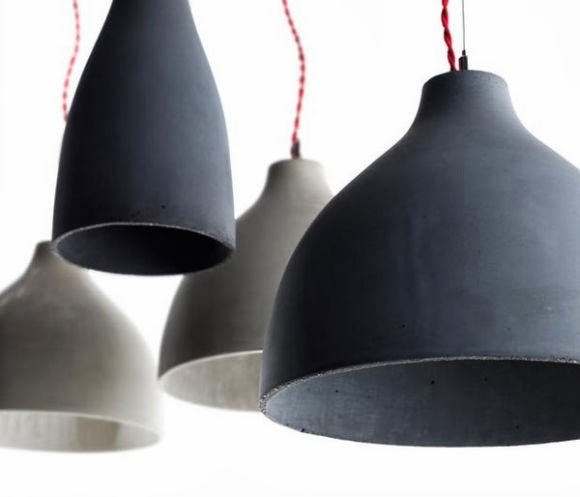 Netherlands-based industrial designer Renate Vos created a series of experimental pendant lamps using an unusual combination of concrete and silicone rubber. 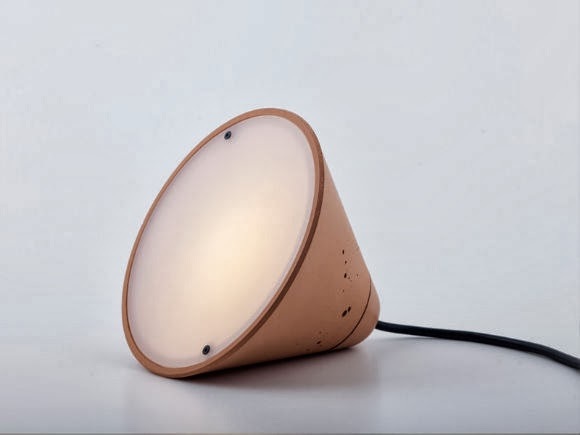 Concrete Bin is a self-produced oval light that is a mostly concrete shade with a border of translucent silicone rubber that emits a warm glow. The Small and Big conic models are produced and distributed by Serax. 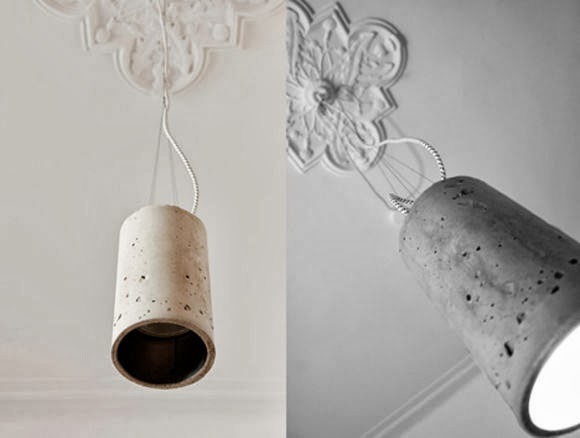 The Real Concrete Tube by Stefan Zickert for Diffikult, is a pendant lamp made of pure concrete. Concrete as a supposedly rough, dure and seemingly archaic material is cast in a strictly cylindrical shape and illuminated. The strength of the concrete remains perceptible. The feel of the concrete surface is soft, the light is warm. The changeableness of this pure material marks the charm of this object. 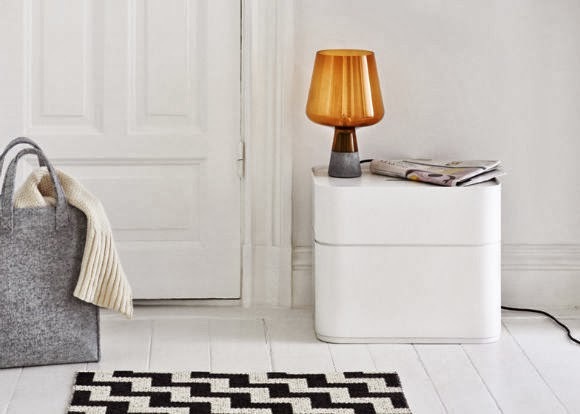 Each lamp is individually manufactured and handmade. 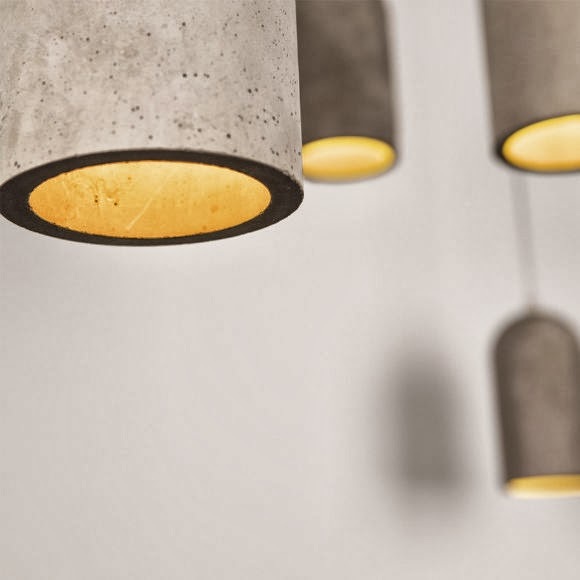 The irregularities and pattern of the concrete surface give each lamp its identity and individual character. 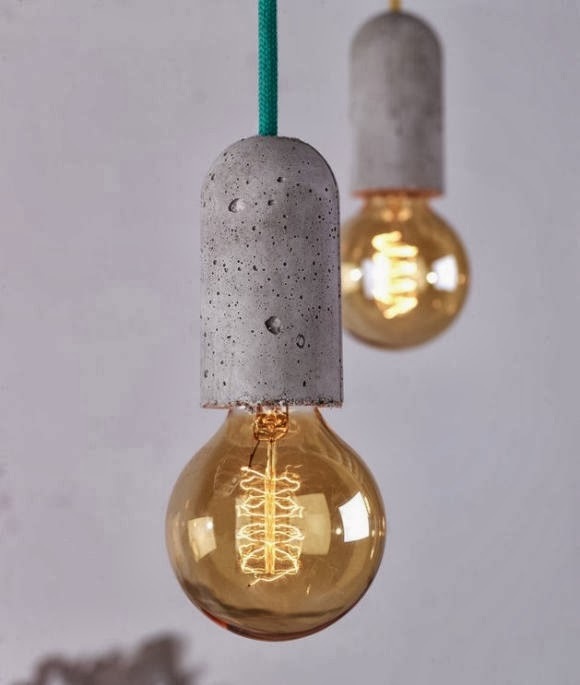 Concrete socket lights. This flexible luminary piece adjusts to any length and the cord is available in 44 different colors and styles. The ultimate industrial pendant with opportunity to personalize by color and length. And colors range from neon pink to zebra skin to emerald to copper ; a wide variety for every possible space. And another bonus : you never need a shade, the socket is the star. Choose from a wide array of bulbs to personalize the experience even more. The devil is in the details, according to NUD architect and designer Mies van der Rohe. And NUD has chosen rough concrete details for this item, exposing the creeks in the cement to get that ultimate industrial feel. 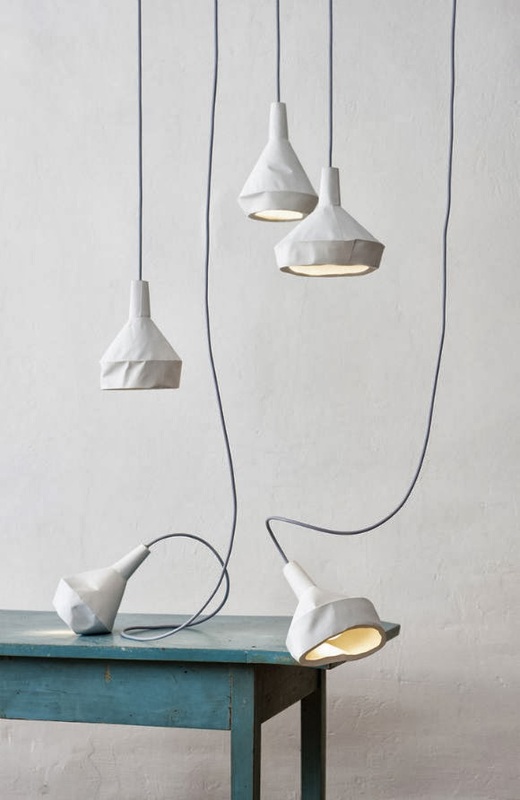 Produced in collaboration with DUA, Miriam Aust and Sebastian Amelung of German studio Aust & Amelung have designed ‘Like paper’, a slewed concrete lamp series that takes shape from what looks to be folded paper. Both its appearance and its haptic form interpret the material in a new context, perceived to look malleable and easy to manipulate. Following the wrinkles of certain patterns, the manufacturing process develops individuality through its various edges, kinks and creases, making each object unique.